place a large heat proof pan on the middle rack and heat oven to 200°. 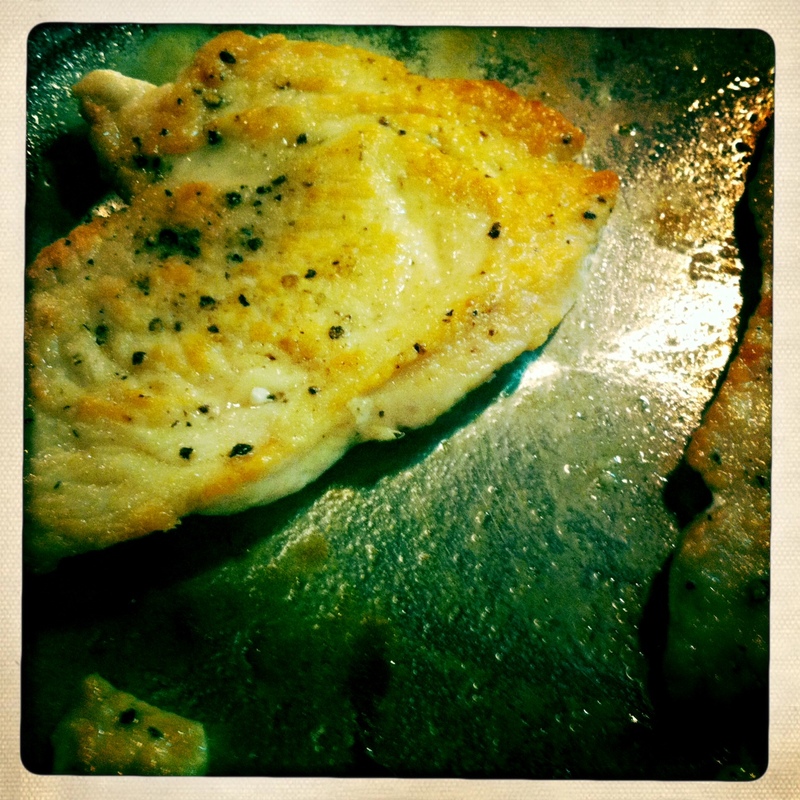 generously sprinkle s+p on the chicken cutlets. put the flour in a shallow dish or plate. coat cutlets with flour and shake to remove excess. heat heavy bottomed 12 inch skillet (not non-stick) on medium-high until hot for about 2 minutes. add 2 tbsp of the oil and swirl to coat the bottom. put half the cutlets in the pan, and without moving them, cook until lightly browned on the first side, 2 to 2 1/2 minutes. turn them over and cook the second side for another 2 to 2 1/2 minutes. remove the pan from the heat and place the cutlets in the warming dish in the oven. add remaining 2 tbsp of oil to the pan and heat until shimmering. repeat the process with the remaining chicken. add the shallot to the empty pan and return the skillet to medium heat. sauté for about 30 seconds. add stock and lemon slices. increase the heat to high and scrape the bottom with a wooden spoon to loosen the browned bits. simmer until the liquid is reduced to about 1/3 cup, about 4 minutes. add lemon juice and capers. simmer again until it reduces to 1/3 cup. turn off the heat and swirl in butter until it melts and the sauce thickens. swirl in parsley. i enjoyed mine with green beans sautéed in butter and lemon, and artichoke with balsamic mayo. perhaps it is time for me to volunteer to be your sous-chef. 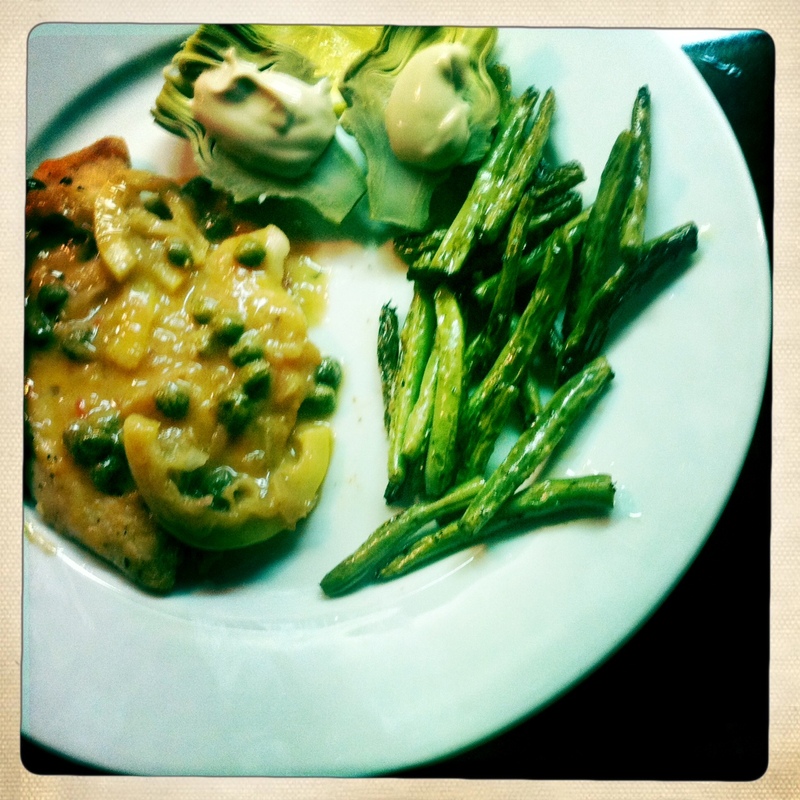 This is one of my fave recipes, but I usually end up getting lazy and kind of half-assing it, making it more of a lemon chicken and less of a piccata. You’ve convinced me to bring on the flour and bring back the capers! 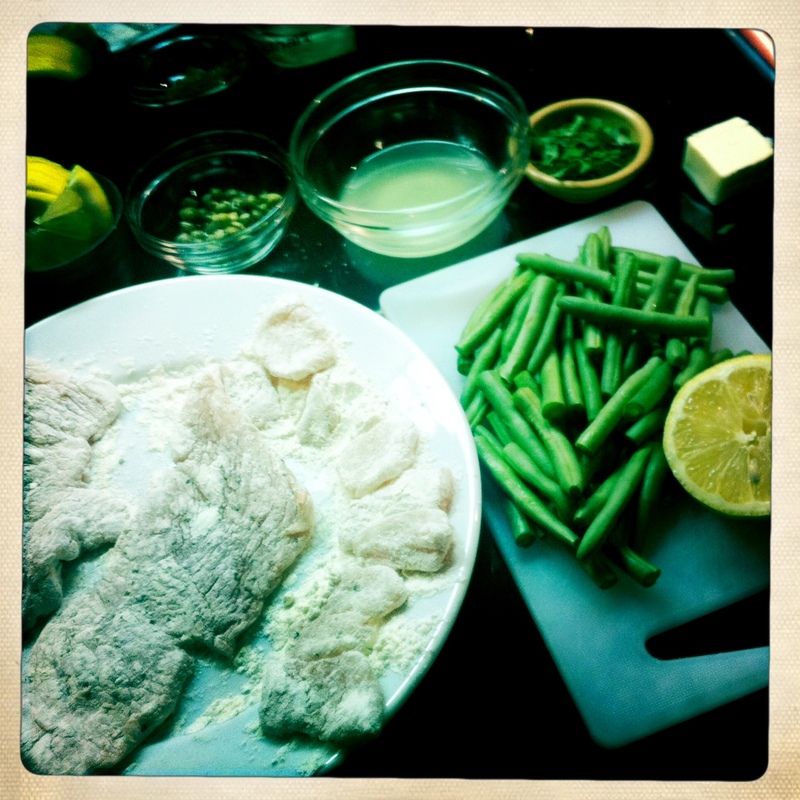 i had never made or eaten chicken piccata before about a year ago because of those damn capers. it’s not that i don’t like them, but they just have such a strong flavor. i was so glad i went against my aversion and tried this recipe out. 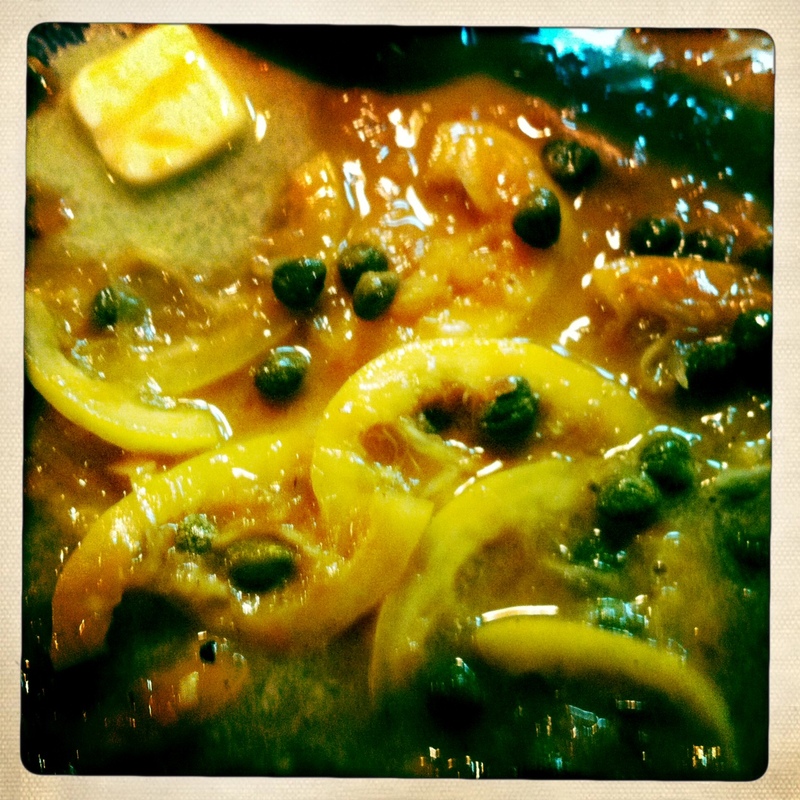 i think the lemon and butter mellow the distinct flavor of the caper out, and the flavors blend really nicely together. it is now one of my favorites too, and it is really pretty quick and easy. Ummmmmmm. And the artichoke. I haven’t had one in way too long.